Each of the domes and flanges on the F4 serve to create an effective seal all the way around the inside of the ear canal. Getting that proper seal against noise is essential; it's what makes the ear plugs able to block their fully-rated NRR 27 protection from sound. That same proper fit is also responsible for ensuring the ear plugs seat comfortably in the ear canals. The F4 has four potential sealing points - 2 domes and 2 flanges - to establish and maintain an effective and comfortable fit that will last all day, even in demanding industrial workplaces. 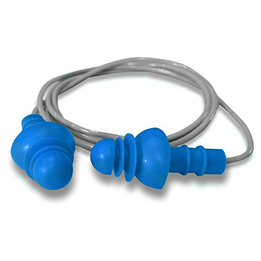 These ear plugs are corded, which makes them easier to keep track of, harder to drop, and convenient to hang around the neck between uses. Hearos F4 Series 7422 Reusable Ear Plugs - CORDED (NRR 27)5Machman57March 6, 2017I love these plugs they work great and are easy to clean!